Never ignore a dental emergency. 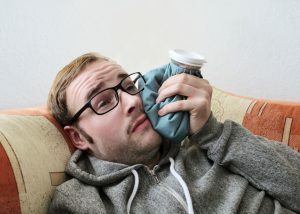 Severe pain, drainage, a blow to the mouth, a lost restoration–left untreated, these issues could lead to permanent damage or costly treatment in the future. Contact your emergency dentist in Oklahoma City, Dr. Joe Isaacson, at the first sign of a problem. You notice dental sensitivity when you chew or when you drink a cup of coffee or glass of cold water. It’s getting worse. Please don’t ignore these symptoms, but call the offices of Dr. Joe Isaacson in Oklahoma City for prompt, caring advice and same-day treatment if necessary. Dental sensitivity, recurring pain, swelling of oral tissues and many other symptoms are not normal, and the risks of ignoring them can be life-threatening. Dr. Isaacson wants all his patients to know their own mouths and what to do if a serious problem occurs. If you have one or more of these symptoms, contact Joe Isaacson Dental right away for advice and for an appointment as needed. This caring team of professionals wants you to act promptly and correctly to avoid the deleterious consequences of tooth loss, abscess and injury. For instance, if a dental abscess is not dealt with quickly, the infection can become pulpal necrosis, destroying a once viable tooth. The infection can spread to adjoining structures and even throughout the body–sometimes a life-threatening situation. Oral swelling often escalates and may obstruct the airway. Additionally, if a tooth has been knocked out, or avulsed, it may be reimplanted. When done quickly, many avulsed teeth are preserved and can continue to function. Time, therefore, is of the essence. Avulsed tooth Rinse debris off the tooth with warm water, leaving residual soft tissue in place. Grasping the tooth by the crown, place the roots back into the empty socket, and hold it there while getting to the dental office. If this is not possible, place the tooth between the cheek and gum, or put it in a sealed container with milk, water, saliva or over the counter tooth preservative. Get to Joe Isaacson Dental. In the case of a fractured tooth or broken filling or crown, save the fragments, and bring them to the office. The same applies to a broken denture, lost crown or fractured bridgework. Cover jagged tooth edges with orthodontic wax or toothpaste. Profuse bleeding or broken/displaced jaw This is a medical emergency. Please go to the nearest hospital emergency room. Dr. Isaacson will follow up with any needed dental care afterwards. Throbbing toothache Contact the office for an appointment. This may be deep decay or even dental abscess. For swelling, apply a cold compress to the jaw, and take over the counter ibuprofen or acetaminophen for pain. Something caught between two teeth Is it a popcorn hull or something more? Try dislodging the debris gently with dental floss. If unsuccessful, you need to call for an appointment. So, at the first sign of trouble, contact Dr. Joe Isaacson. Also, be sure to schedule your semi-annual cleaning and check-up, too, to avoid problems and keep your smile as strong and bright as possible.